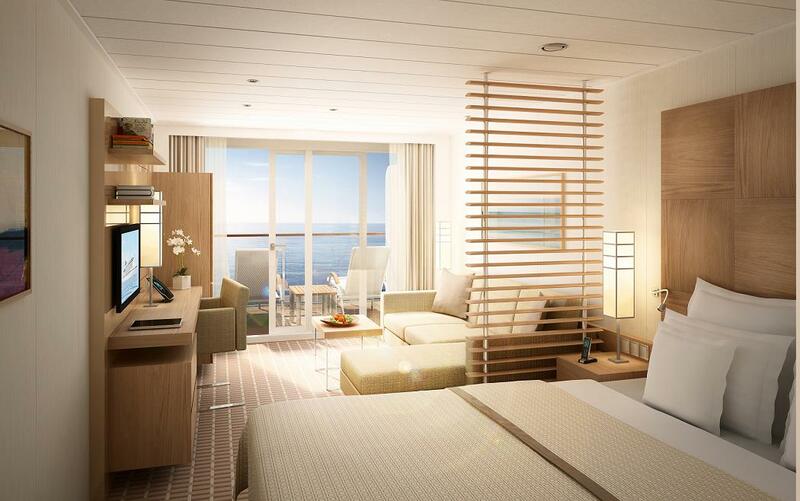 Hapag-Lloyd Cruises’ ultra-luxury Europa 2 takes shape at the STX shipyard in St Nazaire as her suites are installed. Between twenty-five and thirty a week are being installed in the various guest decks. The standard suites are produced in two blocks – the living and the bathroom area. At the factory, more than 150 workers are busy putting suites together on eleven production lines and assembling different elements such as bed frames, slatted frames, desks and wardrobes which have been produced to custom designs. Once secured, the stateroom blocks are loaded, hauled onto the ship with a lift, placed side by side on board and fitted. After this, all that needs to be done is for the carpet to be laid and the sofa to be positioned. While the Standard Suites are assebled in two blocks, the Penthouse Suites are fitted directly on board as they are far too large to transport to the ship. The installation of all the suites will be complete by Christmas. The new Europa 2, which is set to undertake her maiden voyage in May, offers maximum space for all guests – and all suites have their own veranda of at least 75 sq ft looking onto the ocean. Passengers booking now can choose from a total of 251 suites in eight categories – from the Veranda Suite measuring more than 300 sq ft to the Owner’s Suite with its generous 1,065 sq ft. Seven family apartments consist of two separate suites that have both connecting doors and shared verandas. The Europa 2 is a modern and lifestyle-oriented sister ship of the Europa 2, the world’s only 5-star-plus ship (Berlitz Complete Guide to Cruising & Cruise Ships 2013). For more information on Hapag-Lloyd Cruises visit www.hl-cruises.com. For bookings, inquiries, or to request a brochure, please call Gay Scruton at The Cruise People Ltd in London on 020 7723 2450 or e-mail cruise@cruisepeople.co.uk . 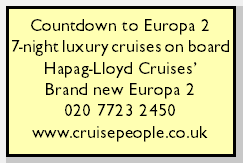 For those following the introduction of the world’s most exciting new cruise ship in a decade, our UK clients will be pleased to know that Hapag-Lloyd Cruises is releasing its English-language brochure for its new 40,000-ton Europa 2 on Thursday, September 13, in London. The new ship has been designed to cater not only to the German-speaking market, where Hapag-Lloyd have been particularly strong, but also to the international trade in general. Now under construction at St Nazaire, in the shipyard that built the Ile de France, the Normandie, the France and the Queen Mary 2, the 516-guest Europa 2 will feature all-balcony accommodations, some of the most stylish restaurants afloat and a myriad of new features, and will have the highest passenger space ratio of any ship afloat. 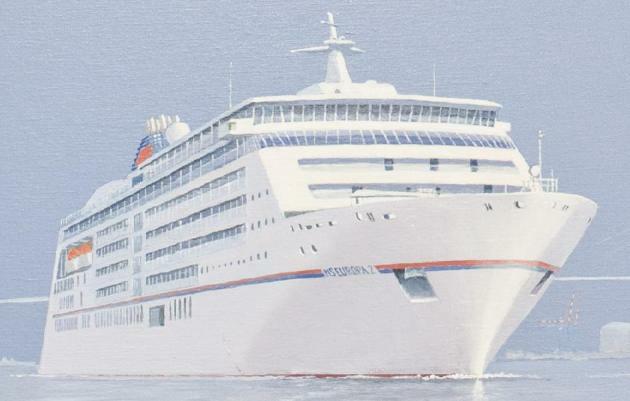 The Europa 2 will undertake her maiden voyage from Hamburg to Lisbon between May 11 and 25, 2013, and may also make an inaugural appearance at Southampton in early May on her way from the shipyard in St Nazaire to her delivery in Hamburg – so watch this space for further news. For further details on any of Hapag-Lloyd Cruises’ international offerings please contact Gay Scruton at The Cruise People Ltd in London on 020 7723 2450 or e-mail cruise@cruisepeople.co.uk. MS EUROPA sets standards worldwide: according to the renowned Berlitz Complete Guide to Cruising & Cruise Ships, Hapag-Lloyd Cruises’ flagship has been rated the World’s Best Cruise Ship 2001 – 2012 for the twelfth consecutive year. She is also the first and only cruise ship ever to be presented a Six Star Diamond Award by the American Academy of Hospitality Sciences. It is her 204 all-suite accommodation, an award-winning service and a high degree of individuality that create the exceptional blend of luxury, spaciousness, exclusivity and intimacy that only MS EUROPA delivers today. * Arrangements not included in the cruise fare. For further details on any Hapag-Lloyd cruise please call Gay Scruton at The Cruise People Ltd in London on 020 7723 2450 or e-mail cruise@cruisepeople.co.uk. From Kiel to Hamburg (EUR1220) via Rügen (Germany), Gdynia (Poland), Visby, Gotland (Sweden), Tallinn (Estonia), St Petersburg (Russia), Helsinki (Finland), Stockholm and Kalmar (Sweden) and the Kiel Canal to Hamburg..
Was 12 days from £4,790 per person in a Category 2 Outside Suite, double occupancy, cruise only. Overnight stays in central St Petersburg on the Neva (and not at the outer docks) and in Stockholm. Now £3,890 per person in a Category 0 Suite, upgraded to a Category 4 Verandah Suite, double occupancy, cruise only. Also available: Golf & Cruise voyage comprehensive golf package* (* these items are optional extras). MS Europa, the only cruise ship to be rated Five-Stars-Plus by the Berlitz Guide to Cruising & Cruise Ships 2001-12, carries a maximum of 408 guests. “The ship will be positioned internationally. 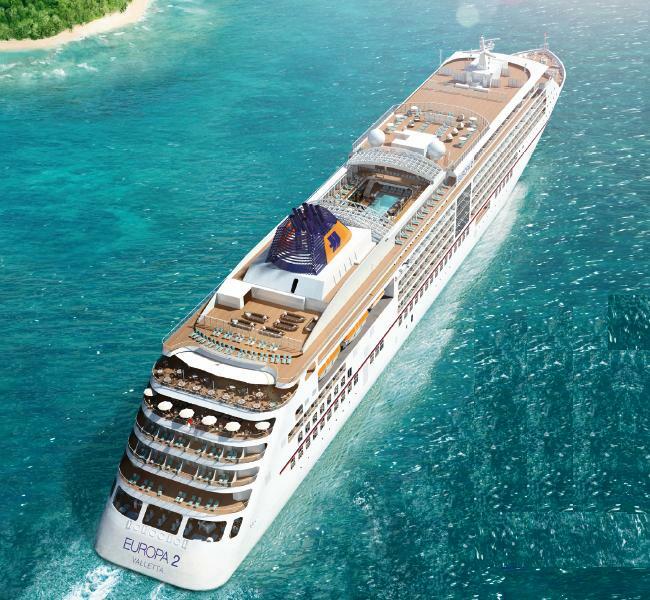 English-speaking guests will feel comfortable on every cruise on Europa 2. Most of the entertainment on board does not rely on language. The on-board announcements will be reduced to a minimum and made in German and English at all times,” added Ahrens. 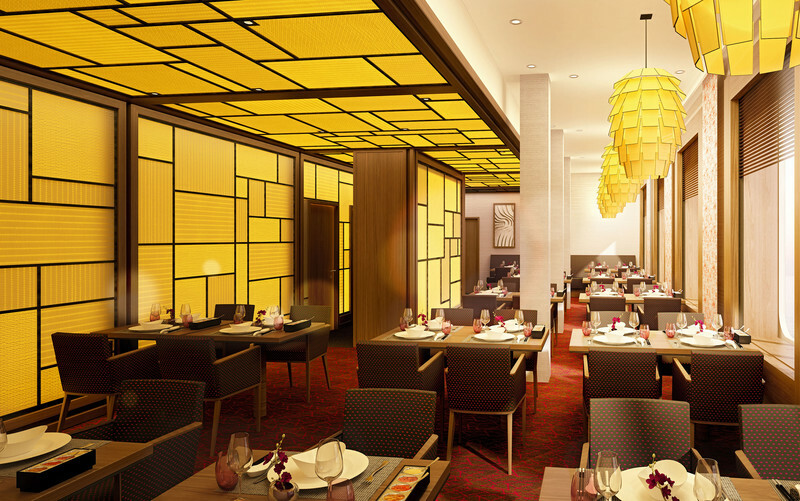 Flexibility and individuality will be found in every detail from entertainment to gourmet cuisine on board Europa 2. The routes of Europa 2 will be geared towards working people and families, with one-week itineraries offered. Personalized service will be heightened, with more than 370 staff members for a maximum of 516 guests, as well as butler and travel concierge services offering unsurpassed quality when it comes to catering to guests’ needs. New standards will also be set with regards to environmental protection – Europa 2 will be the first cruise ship equipped with Selective Catalytic Reduction, which reduce the emission of nitrogen oxides by almost 95 percent. With 7-day combinable cruises to the Mediterranean in the summer and 13-20 day combination cruises to far-away destinations in the winter, Europa 2 will meet the requirements of working people and families with limited holiday time. The ship will call at 123 ports on 26 different itineraries in 2013. Cruises will take guests to the western and eastern Mediterranean and the Arabian Peninsula, as well as Southeast Asia. The size of the ship is a major advantage – with a length of 739 feet and a draught of 20.7 feet, Europa 2 is capable of calling at small, rarely-visited ports such as Bonifacio and Portofino, which is not an option for larger ships. Furthermore, a total of twelve Zodiacs will be carried to take passengers to lagoons and beaches in remote parts of Southeast Asia where ships can’t dock. Europa 2 will exclusively offer Veranda Suites with balconies each measuring at least 75 square feet facing the sea, a novelty in the cruise market. In addition, all suites will have a free of charge mini bar, Wi-Fi Internet access (at a charge) and a tablet PC. The 251 suites in seven different categories will measure in size from 301 to 1,066 square feet and will offer their own whirlpools with ocean view in the highest categories. In addition, 16 Spa Suites will have whirlpool tubs and rain showers with steam saunas, providing guests with a private oasis of well-being onboard. For families traveling together, there will be seven family-style suites where parents and children can live in two separate areas, connected by a door and the shared balcony. The restaurant concept on board Europa 2will be synonymous with diversity and flexibility – flexible mealtimes, no assigned seating, and plenty of tables for two. 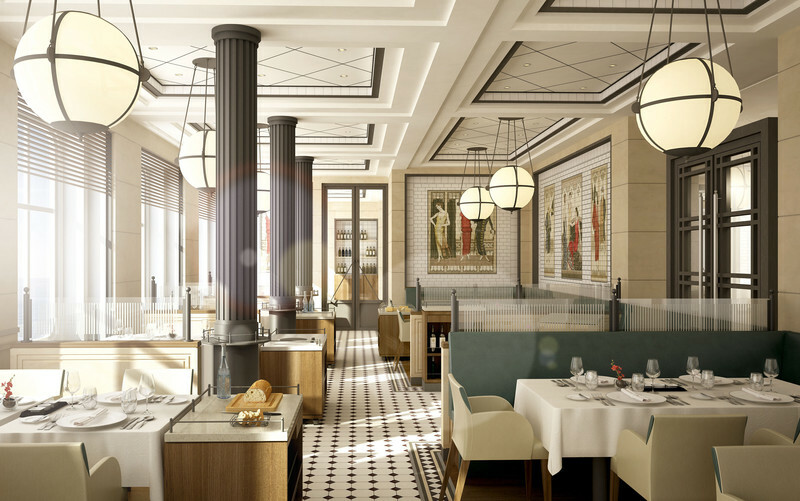 There will be eight restaurants to choose from among them, three speciality restaurants with Mediterranean, French and Asian cuisine, as well as a Sushi Bar. The Asian restaurant Elements provides an interesting comparison with Canadian Pacific’s Empress of Britain of 1931, which as the time was advertised in Germany as “das Luxusschiff der Welt” (“The Most Luxurious Ship in the World”). 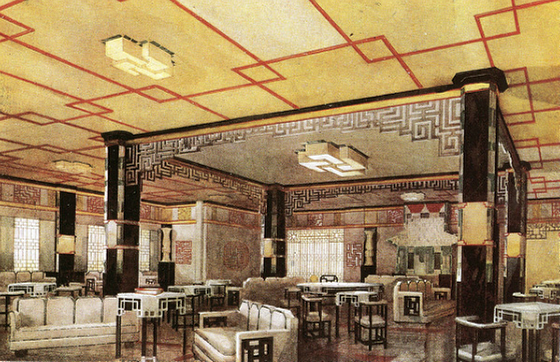 One of the Empress of Britain‘s chief attractions was the Chinoiserie used in her decorations, particularly in her Cathay Lounge, something that stemmed from Canadian Pacific’s Transpacific ocean liner service between Vancouver and the Orient. 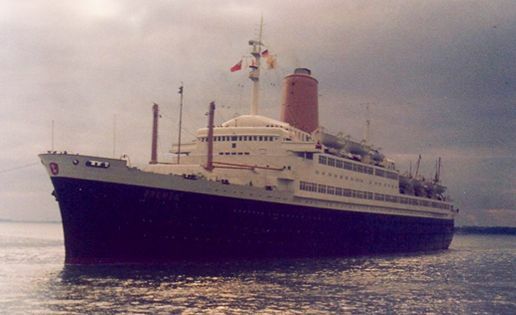 This is interesting as it was Hapag-Lloyd that took over CP Ships, the former Canadian Pacific Steamships, in 2005. 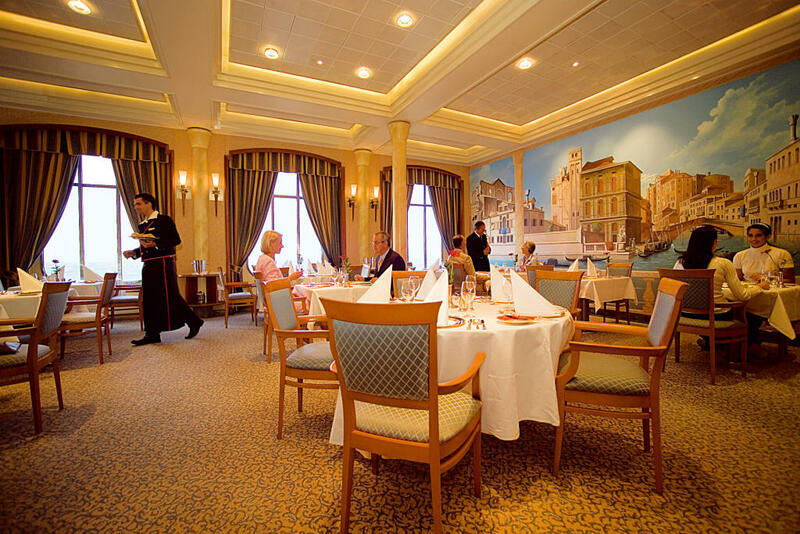 The Tarragon French restauramt on board Europa 2. No extra charge to dine here. All restaurants will be included in the cruise price (excluding beverages). On special occasions, guests can book the private dining room, allowing them to dine in a very personal atmosphere. There will also be an on-board cooking school, equipped by Miele, where professional chefs will provide guests with unique insights. In addition to the eight restaurants, six bars are to be found on-board. The entertainment programme will reflect the modern concept Europa 2. The theatre will have modern stage technology and a large LED wall extending across two stories – a novelty on a relatively small ship. For the first time for Hapag-Lloyd Cruises, the entertainment programme will feature spectacular productions, performances and light shows. The shows will have no adaptation of shore programs, but instead will be exclusively performed aboard Europa 2. Two different shows per week will be offered, ensuring plenty of variety. Passengers who spend 14 days onboard will see four different shows. International guest artists will further enhance the entertainment program. Many shows do not start simultaneously, allowing guests to enjoy more than one show nightly. Guests will also find diversity and plenty of space in the wellness area of Europa 2, which will boast 1,000 square metres/ 10,000 square feet. Treatments ranging from massages, to facials, to Thalasso therapy will be offered in the eight treatment rooms at the Ocean Spa. The extensive sauna landscape grants every guest more space to relax than any other ship of this class. In addition, passengers can book a Personal Spa experience and enjoy the private sauna and whirlpool facilities, as well as massage beds and comfortable relaxation furnishings, by the hour or the day, in an intimate atmosphere. The on-board facilities also include a large fitness area with fitness and cardio equipment, as well as a room where Pilates and Spinning will take place. Upon request, a Personal Trainer is available to counsel guests on their workout, and sports hosts are available to organise shore excursions, for example, bicycle tours or Nordic Walking. Young cruise passengers are sure to enjoy themselves in the Kids and Teens Club, compiled by qualified child care specialists. For the first time in the German market, child care will now be available for toddlers two and older on board Europa 2 (subject to charge). There will be a special area for the infants called the “Knopf Club,” equipped with cots, changing tables and a lounge furnished with cuddly toys, by the renowned manufacturer Steiff. Steiff is a German-based plush toy company known for its high quality for over 100 years. Children aged 4-10 years old play in the adjacent Kids Club, and children 11-15 years old meet in the Teens Club, where table football, video game consoles, or the disco will await them. Children eleven and under will travel free of charge on board Europa 2, when accompanied by two full-price cruise guests. Shore excursions for children, teenagers, or the entire family are offered on all family cruises. For more information on Hapag-Lloyd Cruises’ exciting destinations and itineraries visit www.hl-cruises.com. For bookings or brochure requests please call Gay Scruton at The Cruise People Ltd in London on 020 7723 2450 or e-mail cruise@cruisepeople.co.uk.